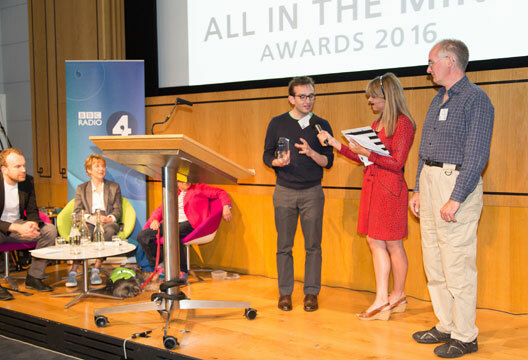 Some of Britain’s most amazing advocates for mental health have been honoured at BBC Radio 4’s All in the Mind Awards at a ceremony at London’s Wellcome Collection. The awards, set up two years ago to mark the programme’s 25th anniversary, recognise a professional, an individual and a project that have gone beyond all expectations to support people with mental health problems. The judging panel, author Matt Haig, Kevan Jones MP, Marion Janner, founder of Star Wards, clinical psychologist Linda Blair and All in the Mind presenter Claudia Hammond, had the difficult task of choosing between scores of wonderful stories. The winner in the Individual category was Jane nominated by her friend and neighbour Charlotte, an A&E Consultant, who turned to Jane after losing her young daughter Abigail who died in the hospital where Charlotte worked. Jane not only provided comfort to Charlotte but helped her with her difficult return to work – Charlotte told the BBC programme that Jane had been there to support her on her first days back at work. Upon receiving her award Jane said: ‘We British people are quite reserved around death and grief, but there’s no need to be. You just have to be open about it and be there for someone.’ Marion Janner, who presented the award, said those living with mental illness and those supporting them had all shown extraordinary tenacity, resilience and good humour in the face of incredible challenges. Glasgow’s Common Wheel was named as winner of the Project Award. The group welcomes people with mental health issues who are encouraged to pick out an old bike and repair and restore it over the weeks and months they visit. Christopher, who visited and nominated the project, said learning a new skill and keeping busy helped him get through each day. Presenting the Professional Award, Linda Blair said although mental health workers all do a vital job some go the extra mile. Amy, a support worker from Turning Point, won the award after being nominated by ‘John’ a former prisoner who also struggled with a personality disorder. Although he was initially suspicious of programmes to help ex-offenders ‘John’ eventually felt able to open up. The evening of awards also featured the finalists in the same categories, which also included The Tomorrow Project, a community-based counselling service set up in a Nottinghamshire village after suicides there amongst teenagers. The work of a GP, Dr Dietch, who helped his patient receive appropriate treatment for bipolar disorder, and helped mental health professionals treat her when he was out of the country. A boss called Blair who supported employee Steven through some of the hardest times in his life, including crippling anxiety. Ellie also nominated her mother Bernadette who has helped her cope with suicide attempts and depression throughout her teenage years.